I like surprises, as long as they're good surprises. Spelunky is a lovely surprise. The only annoying thing is that I didn't get around to playing it before now... especially as I seem to have an older, unzipped version sitting on my hard drive. That's time I've wasted when I could have been playing the game! 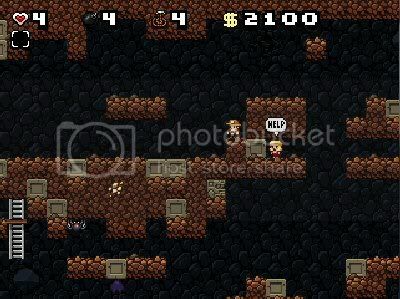 Spelunky puts you in the boots of a caver. You're off exploring caves for treasure, and there are cave critters to defeat and damsels in distress to rescue. You'd be absolutely right in thinking that it sounds familiar... it most definitely is. There's more than a nod to the past here - the whole game feels old-school, and is absolutely no worse off for that. There are a few minor control scheme niggles... it can be tricky to pull off exactly the move you want at the right time or in the right place, and I haven't figured out how to do certain things whilst carrying a stranded woman (yes, really). Generally speaking though, Spelunky offers hours of snake-whipping, bat-bashing, treasure-hunting entertainment.